“What the hell’s a Texas A&M?” asked Tennessee forward Candace Parker. Many of the universities were caught off guard by the surprising competitions. University of Hartford Hawks coach Jennifer Rizzotti had sent her team home for spring break after a win over Boston University in the America East Conference Championship. “I thought, great game, something to build on next year, maybe down the road we could send a nice letter to Storrs and see if we could practice against them in a November tune-up,” said Rizzotti from a hotel room in Baton Rouge. “We had to cut three players’ trips to Cancun short for this stupid thing. What’s the point?” In a sign of protest, Pittsburgh University sent only their mascot ROC the Panther to their games. The Panther defeated several women’s teams before losing its third contest to Stanford 72-53. 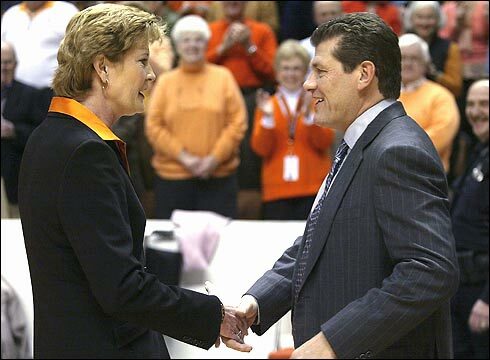 Aside from each other, Tennessee and UConn have never been beaten.